Of major interest in Educational Technology is Big Data, which is a rather all-encompassing term for the vast mountains of information that our computers are collecting and how we humans might take advantage of it. The 2014 NMC Horizon Report for Higher Education highlighted this interest, noting that the “Rise of Data-Driven Learning and Assessment” and “Learning Analytics”, both of which revolve around the anlysis of Big Data, are technological trends that may have profound impact on education as we know it. A primary goal of several MOOCs, including edX, HarvardX, and MITx, is to research the data they collect from thousands of world-wide participants. And here, at Harvard, a main objective of the new Teaching and Learning Technologies program is to research all the data our new Learning Management System and associated tools will provide. Finally, our own little group, the Academic Techngology Development team, is starting to research how we can best analyze the data our tools collect. The main drive behind this interest in Big Data–at least, in Educational Technology–is the belief that through analyzing all of this information, we can create a better teaching and learning experience for instructors and students. 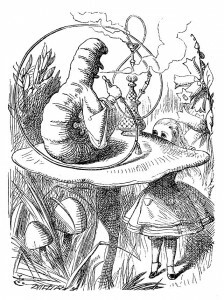 The idea goes something like this: Alice, a student at Wonderland University, takes a course on existentialism from the Caterpillar. As Alice completes her assessments, the results are stored online, and through careful analysis of these results, the Caterpillar is able to deduce which concepts Alice is having difficulty understanding, and in which conecpts she is excelling. The Caterpillar can then tailor Alice’s future work to her needs, thus creating a better learning experience for her. That’s the simplified version of the tale; many other permutations exist. For example, the Caterpillar may recognize that another student, Tweedledee, excels in one area that his brother, Tweedledum, does not, and decides to pair the two up so that Tweedledee can help his sibling. Or, perhaps, the Caterpillar discovers that his students grasp the concepts of mushrooms better when he discusses the concepts of fungi first, and adjusts his future syllabi accordingly. Regardless of the scenarios, the promises of Big Data rely on the firm belief that something meaningful exists somewhere in all of that information, and that if we extract that meaningful something, then we can do something meaningful with it. Sound a bit ethereal? It’s not, as commercial companies such as Amazon, Netflix, and Google have uncannily demonstrated with their search and recommendation enginees. And in regards to applying Big Data to education, there’s a large field of research going on, not to mention a growing field of application and practice.